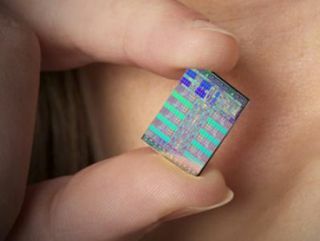 It's official: Sony is to team up with Toshiba to produce 45nm Cell chips for the PlayStation 3. The announcement comes on the day that Sony set up a joint venture company with Toshiba to produce Cell chips - a story Tech.co.uk first ran back in September. The as yet unnamed company will see Toshiba take over production of 65nm chips used in current PS3s, with the aim being to move to a 45nm process at some undisclosed point in the future. "Toshiba and Sony Group will together promote further advances in manufacturing technologies and efficiencies by leveraging their knowledge and experience, targeting migration to 45nm process mass production," the official press release wordily says. The manufacturing facility in Nagasaki will also be responsible for making the RSX graphics engine, which is also used in the PlayStation 3. The Sony-Toshiba joint venture will be established on April Fool's Day next year, with market capitalisation of 100 million yen. Toshiba will take a majority 60 per cent stake, with Sony Corporation and Sony Computer Entertainment International (SCEI) grabbing 20 per cent each.